272 people want to go here. 40 people have been here. Israel, officially the State of Israel, is a parliamentary republic in the Middle East located on the eastern shore of the Mediterranean Sea. It borders Lebanon in the north, Syria in the northeast, Jordan and the West Bank in the east, Egypt and Gaza on the southwest, and contains geographically diverse features within its relatively small area. Israel is the world's only predominantly Jewish state, and is defined as A Jewish and Democratic State by the Israeli government. The Dead Sea Arabic البحر الميت al-Bahr al-Mayyit, Hebrew: יָם הַ‏‏מֶּ‏‏לַ‏ח‎, Yām Ha-Melaḥ, "Sea of Salt", also called the Salt Sea, is a salt lake bordering Jordan to the east, and Israel to the west. Its surface and shores are 422 metres (1,385 ft) below sea level, the lowest elevation on the Earth's surface on dry land. The Dead Sea is 378 m (1,240 ft) deep, the deepest hypersaline lake in the world. It is also one of the world's saltiest bodies of water, with 33.7% salinity. Jerusalem (Hebrew: ירושלים ''Yerushalayim'', Arabic: ''القدسal-Quds'') is a holy city to three religions (Judaism, Christianity, and Islam), is the country`s largest city. 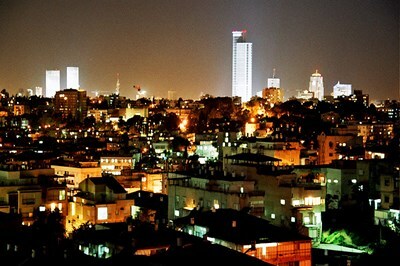 The ''City of Gold'', as it has come to be known in Hebrew, is a fascinatingly unique place where the first century rubs shoulders with the twenty-first century, each jostling for legitimacy and space, and where picturesque "old" neighborhoods nestle against glistening office towers and high-rise apartments. It is one of those places which has to be seen to be believed. The Dome of the Rock is an Islamic shrine and major landmark located on the Temple Mount in Jerusalem. It was completed in 691-692, making it the oldest existing Islamic building in the world. The site's significance stems from the religious beliefs regarding the rock, known as the Foundation Stone, at its heart. Masada (Hebrew מצדה, pronounced, from מצודה, metzuda, "fortress") is the name for a site of ancient palaces and fortifications in the South District of Israel on top of an isolated rock plateau, or horst, on the eastern edge of the Judean Desert overlooking the Dead Sea. After the First Jewish-Roman War a siege of the fortress by troops of the Roman Empire led to the mass suicide of the Sicarii rebels, who preferred death to surrender. It is located about 20 km east of Arad. Gethsemane is a garden at the foot of the Mount of Olives in Jerusalem most famous as the place where Jesus and his disciples prayed the night before Jesus' crucifixion. The Western Wall, Wailing Wall or Kotel; and known by Arabs as Ḥā'iṭ Al-Burāq, is located in the Old City of Jerusalem at the foot of the western side of the Temple Mount. It is a remnant of the ancient wall that surrounded the Jewish Temple and is one of the most sacred sites in Judaism. Just over half the wall, including its 17 courses located below street level, dates from the end of the Second Temple period, being constructed around 19 BCE by Herod the Great. The Dome of the Rock is in the centre of a greater Muslim shrine, known as the Haram ash Sharif (Noble Sanctuary), which Muslims believe commemorates Muhammad's miraculous Night Journey into heaven. The Dome is a shrine located on the Temple Mount in the Old City of Jerusalem."